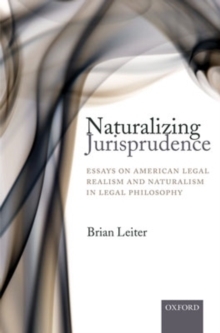 Brian Leiter is widely recognized as the leading philosophical interpreter of the jurisprudence of American Legal Realism, as well as the most influential proponent of the relevance of the naturalistic turn in philosophy to the problems of legal philosophy. This volume collects newly revised versions of ten of his best-known essays, which set out his reinterpretation of the Legal Realists as prescient philosophical naturalists; critically engage with jurisprudentialresponses to Legal Realism, from legal positivism to Critical Legal Studies; connect the Realist program to the methodology debate in contemporary jurisprudence; and explore the general implications of a naturalistic world view for problems about the objectivity of law and morality. Leiter hassupplied a lengthy new introductory essay, as well as postscripts to several of the essays, in which he responds to challenges to his interpretive and philosophical claims by academic lawyers and philosophers. This volume will be essential reading for anyone interested in jurisprudence, as well as for philosophers concerned with the consequences of naturalism in moral and legal philosophy.